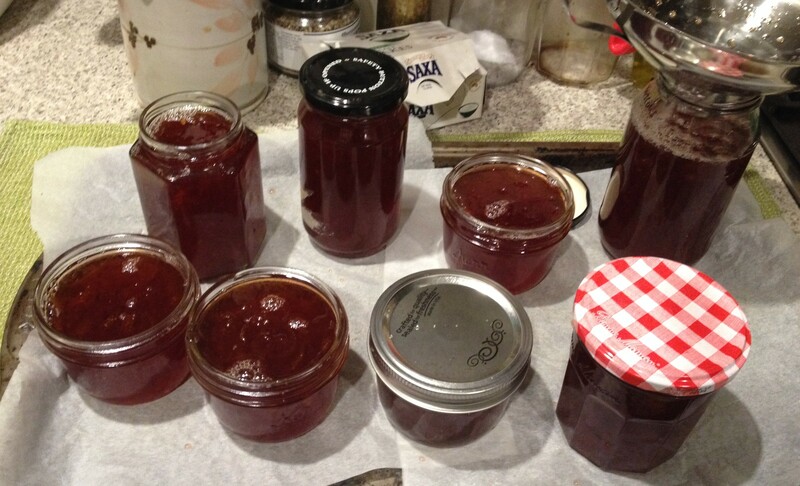 Anyway, when I got another batch, I decided I had to try marmalade. The combination of blood limes’ very thin peel, as well as their lack of bitterness means they’re really the perfect combination for preserving. Next season I’m definitely going to try them in some sort of pickle or chutney. This recipe makes quite a large batch, and given blood limes aren’t always readily available, and are therefore relatively expensive, you may want to halve the quantities. As you can see from the photo, in this particular batch I’m cooking fewer halved limes as I saved the liquid from the limes cooked for the Blood lime, almond and coconut cake. Doubling up and making the cake as well also means you don’t have to waste the cooked halved limes. Separating the limes and cooking two batches differently might sound like a complicated method, but basically you’re just increasing the jelly component of the final product by adding extra liquid, so it has a less chunky texture and is easier to spread. Marmalades I made before trying this method were almost unspreadable because they were more chunks than marmalade! 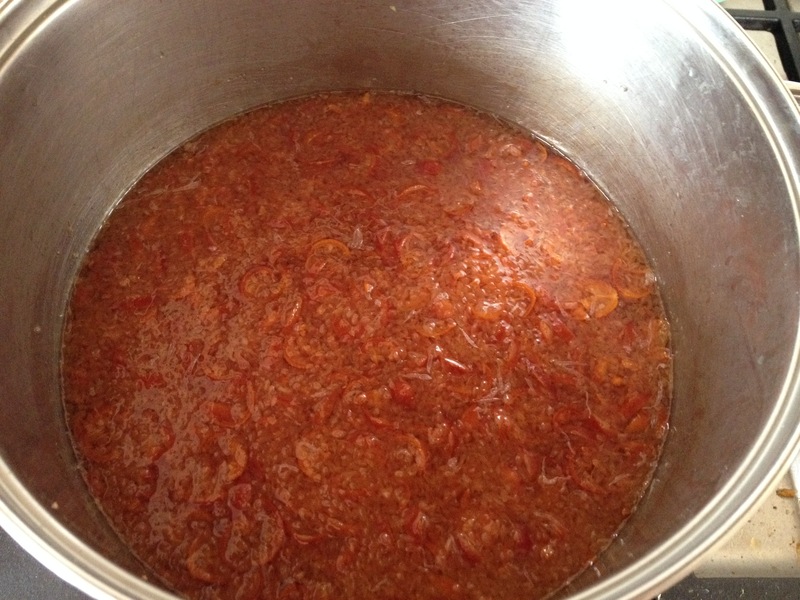 For further details of the method, also read this marmalade post. Cut half the blood limes in halves or quarters depending on size, and put in a medium saucepan. Cover with water until they have room to float, and leave overnight. Alternatively, which is what I did, soak first thing in the morning, then move onto step 2 that night. Bring the halved limes to the boil, reduce heat, and simmer for about an hour until very soft, and the liquid is slightly syrupy. Cover and leave overnight. While the limes are cooking, cut the remaining 900g of limes in half lengthways, and slice across into thin semi-circles. Pick out the seeds as you go, and chuck them in with the cooked lime halves. Cover the sliced limes with water by about 1.5cm, pressing down on the fruit to check the level, and also cover and leave overnight. Bring the sliced limes to the boil in a large saucepan, reduce heat, and simmer rapidly until limes are tender. You will undoubtedly have missed some seeds, so pick out any that float. Because the peel is so thin, cooking time is quite rapid compared to other citrus, about 20min. Remove from heat when cooked, and add the strained liquid from the halved limes. Add the lemon juice and sugar and stir to combine. Sterilise 12 8oz jars (I always do a couple extra) and put a saucer and teaspoon in the freezer to test the set. The method I use to sterilise is here. Bring the mixture to a boil over high heat and continue boiling rapidly for about 30 min. As the water evaporates and the sugar concentration increases it will foam a lot, so don’t walk away, and be prepared to turn the heat down or take it off the heat if it foams up too much. Stir occasionally with a wooden spoon or silicon spatula to ensure the bottom isn’t sticking. After 30 min, or when you think it might be nearly ready, pour a small amount in the chilled spoon and put back in the freezer on the saucer for a couple of min. You may need to test a few times. When the cooled liquid turns jellyish, it’s done. Another sign is the marmalade forming a slight skin and wrinkling around the edges of the pan or on the spoon handle. Turn off the heat and skim any foam off the top. Pour the marmalade into the sterilised jars, seal and cool. I’m writing this now to the gentle popping sound of the lids as they seal! I think your method of reducing the peel content is a great idea for this marmalade. The colour of blood lime marmalade is superb, but with too much chunk, the effect is a little overwhelming. I used my more chunky marmalade as the basis for your blood lime cake and that combo is definitely a keeper. I have to say, though, that the peel is a bit bitter and the final product places this marmalade firmly up there with Seville Orange and Lime. Yummy on hot buttered toast, though! How exquisite! I have yet to try these little beauties. Nice job. Chuck them in the freezer if you find any Liz, they freeze whole and defrost perfectly! wow, i’ve never seen a blood lime before. things to look for the next time i’m in a land of limes! Thanks Myriam, unfortunately I don’t think you can get them outside Australia as they are a hybrid of a native Australian species – though I could be wrong… Perhaps in California, they seem to grow every sort of fruit there!